During the long weekend, I walked over to the woods in Como Park to look at the fireplace. Over the years, I've watched this strange, somehow magnificent stone structure slowly crumble into ruins. It was many years before I knew what it was; I always found it odd and mysterious. It sits all alone, tucked back from the road on the top of a small rise, best reached by a path through the woods. For a long time it was cordoned off with orange snow fencing and a chain-link fence, maybe because it was falling to pieces and had become dangerous. Maybe because hooligans gathered there late at night to spray grafitti and build fires and party. It looked like a giant chimney, but what was a giant chimney doing without a giant house attached to it? As it turns out, it is not a chimney, exactly, but a fireplace, and it is a monument for Joyce Kilmer, a patriot who never lived here. Kilmer was a New Jersey poet and a hero in World War I. He died in battle in France on July 30, 1918. 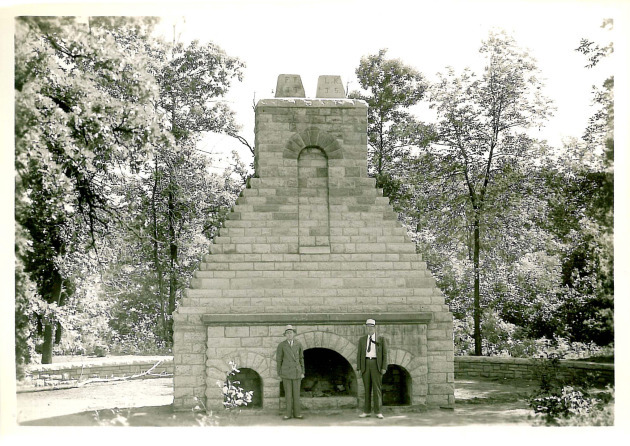 A Minnesota American Legion post was named in his honor, and the fireplace was built and dedicated in 1936. I have not yet figured out why they chose a fireplace to honor him; his most famous poem was about trees (and was called "Trees"). Originally, there was much more to this memorial than the fireplace. There was a waterfall (though I cannot figure out precisely where, since there is no stream nearby), and a wooded grove, and a plaque with his poem. And now, with the help of Legacy Fund money, it is all coming back together again. The fireplace has been repaired. It is no longer crumbling, but strong and neat, the fencing gone. It is surrounded by a smooth circle of concrete, and a stone wall. Invasive plants are being ripped out, and the grove of trees will be replanted. It was rededicated in May, with flutes, and sage, and schoolchildren. 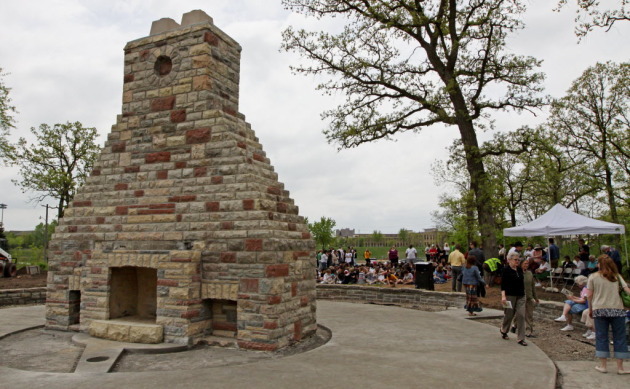 When I walked around it on Sunday, I noticed several charred logs inside the fireplace, so I'm thinking it's already been re-re-dedicated, maybe more than once. But that's what a fireplace is for--a cheery fire. It is still a somewhat mysterious presence in the park, but now it is beautiful again. Amazon ranks 'readingest' cities, and leaves out Mpls./St. Paul? He writes! He sings! He reads!